The Fourth Lateran Council of 1215, convened by Pope Innocent III, proposed that each metropolitan parish would “install a theologian to teach scripture and pastoral care” to clerics, using as the syllabus the first article of the General Council, De fide catholica (Birkett 201). The intent of this mandate was to ensure the proper edification of the laity in a language that they could understand. Instead of composing didactic literature in Latin, the lingua franca of the Church, priests were instructed to produce edifying texts in the vernacular so that the laity would have access to a basic education in their faith. The result of this mandate was the development of the genre of the cura pastoralia, or pastoral literature—literature intended to educate the flock. 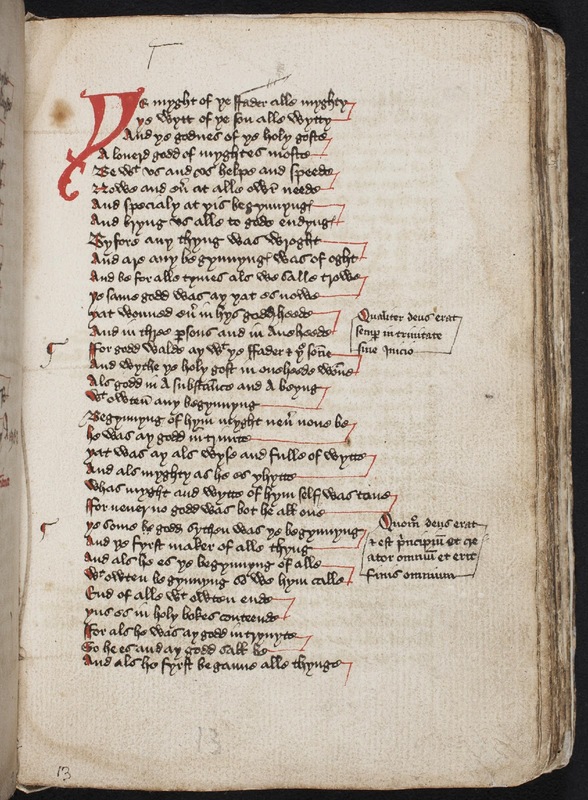 William Langland’s Piers Plowman (1387-9), Nicholas Love’s The Mirror of the Blessed Life of Jesus Christ (1409), and the anonymously written Cloud of Unknowing (1370s) all participated with explicit acknowledgements towards the use of the English vernacular. Within the same period we find the production of the Prick of Conscience. of the Christian faith which acts as both a reinforcing mechanism and a finding aid for the reader. þat can noght bot Inglise undirstand. It may his conscience tendre make (lines 9542-9551). “Lewed” men (and women) refers primarily to those who are not educated in Latin and “can noght bot Inglise undirstand” (line 9545). Thus the poem, at first glance, is intended to be read by English speakers. However, the witness Wellesley College MS 8 complicates this assumption with its inclusion of Latin glosses. Why would a text intended to be read and understood by English speakers and readers include glosses in a language that they would be unable to comprehend, let alone interpret? To answer this we can finally turn to the glosses themselves and look at a few of the other 130 witnesses to explore why these glosses were included. The witnesses can be divided into several categories: 99 main versions, 19 southern recension versions, 49 extracts, two copies titled Speculum huius, one partial prose redaction, two early print editions, and, most compellingly, six Latin versions (Morris 378). What these witnesses demonstrate is a relative stability in the use of glosses; that is, the glosses consistently appear in some manuscripts, but the language in which they are written in differs. “Howe God was ay in trinite without byginnyng” (3). The Richard Morris edition of The Prick of Conscience, “corrected and amplified” by Ralph Hanna and Sarah Wood, expands much of Morris’ original work but includes a greater number of witnesses than Morris: British Library MS Cotton Galba E.ix; British Library MS Harley 4196; Bodleian Library MS Rawlinson Poet. 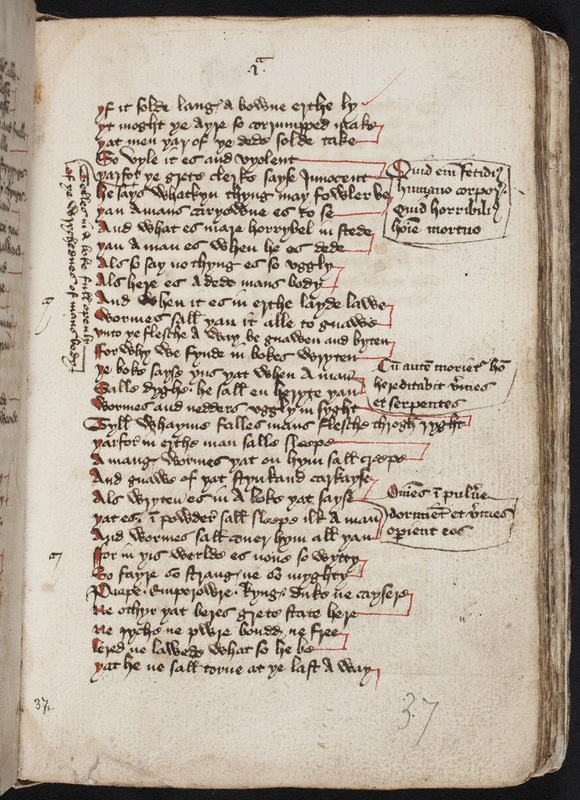 175; British Library MS Additional 33995; Wellesley, Mass., Wellesley College MS 8; London, Lambeth Palace Library MS 260; Cambridge, Fitzwilliam Museum MS McClean 131; Bodleian Library MS Ashmole 52; and finally London, Sion College MS Arch. L.40.2/E.25. This extensive edition, which builds upon Morris’ use of only the first two manuscripts in the above list, fleshes out the textual history of the poem. The editorial decision to include the glosses as marginal notes in the new edition suggests consistency of glossing in the above manuscripts. (One limitation of this argument is access; I have been able to access only Wellesley MS 8, and therefore cannot speak truly of the existence of the glosses in the other manuscripts.) The editorial decisions of Hanna and Wood lead me to believe that the glosses were in fact stable. The glosses I have quoted summarize a chief point of Christian belief, which is that God is in the trinity and that the trinity has no beginning. 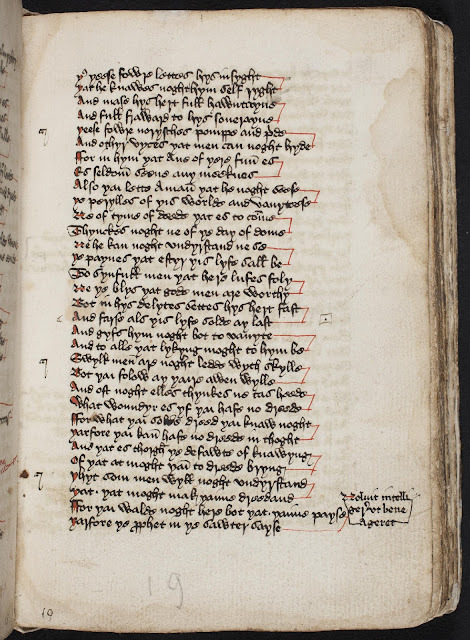 The gloss itself appears next to two lines in the poem: “For God wald ay with þe Father and þe Son/ And wyth þe Hali Gast in anhede won” (lines 15-16). It is obvious from the English gloss that this was meant to reinforce the poem as a summary of the second clause of the Nicene Creed, but it also functions as an indexing aid for the reader to identify an important theological and doctrinal belief. Why, if the text was written in English, would the scribe choose to gloss important doctrinal references in Latin? For whom were these glosses intended? others that quote the Bible, is written in Latin. 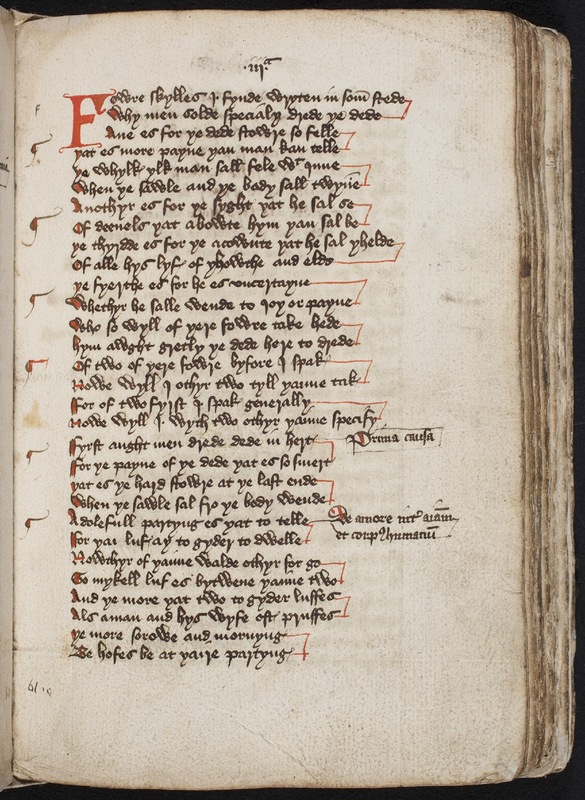 We have already seen that the main text was intended for an English audience, but that does not suggest necessarily that the poem was intended to be read by an English audience. An alternative possibility is that poem was composed with the listening audience in mind. The poem could have been read aloud by a Latin reader to a group of English speakers. The glosses clearly become used as references for a Latin reader who would be able to understand the references, many of which are scriptural, but a few of which come from Pope Innocent’s text De miseria conditionis humanae. Finally, to return to the initial question of why Latin glosses would be used in an English text for an English audience, one possible explanation is that the text, at least this witness of the text, was not meant to be read by the “lewed” at all. It was meant to be read by someone who was familiar enough with Latin to be able to navigate and interpret the glosses as a form of additional edification for the English audience. Ordinarily it is difficult to tell from the material form of a written text what the actual conditions of its reading were. It is particularly impossible to determine conclusively whether a written text was intended to be read silently or aloud. In this case the Latin glosses, somewhat paradoxically, are strong evidence for the oral delivery of The Prick of Conscience to an English-speaking and possibly illiterate audience. Birkett, Helen. “The Pastoral Application of the Lateran IV Reforms in the Northern Province, 1215-1348.” Northern History, 43:2, 199-219. Prick of Conscience. Ed. James H. Morey. Kalamazoo: Medieval Institute Publications. 2012. Web. Watson, Nicholas. “The Politics of Middle English Writing.” The Idea of the Vernacular: An Anthology of Middle English Literary Theory, 1280-1520. Ed. Jocelyn Wogan-Browne et al. University Park: Pennsylvania State University. 1999. 331-352. Print.